I happened to check my site traffic stats last weekend and was frankly shocked to see that this old post from 2014 is getting a ton of views: Near Luxury Brands, Which is Your Favorite? In four quick years, there’ve been beaucoup changes in the fashion, retail, and luxury industries. Today, the most relevant “near luxury” brands are technology-native startups, addressing consumers’ desire for more than just cute, upmarket clothes. They want greater ethical considerations about manufacturing(/sourcing) and materials sustainability, functional and/or tribe-specific design, more convenient access and delivery, and better overall quality for the price. Most of the brands I wrote about in 2014 operate on a wholesale model where they reach more customers by selling to retailers (department stores and independent boutiques), while selling less through direct to consumer channels (i.e. their own-branded stores). This, though, creates a profit margin structure that requires more mark-up (and eventually, more discounting in order to move merchandise) and a brand experience that is less consistent (read: easily controlled) across touchpoints. Imagine the Vince sweater that is available online directly from Vince, as well as online and offline at various department stores and websites (like East Dane or Zappos Couture). Eventually it’s discounted to varying degrees at end-of-season, potentially having been bought and returned more than once either online or offline, before ending up at Nordstrom Rack store 3-5 months later, collar label hanging by a single thread, fighting for the light of day. Many brands that now fit the description of “near luxury” are young startups going directly to consumers, online and offline. They all offer a similar quality and style at a lower price (by skipping the wholesale route altogether), and have a singular brand experience that is more consistent. They offer free shipping and returns, and invest heavily in digital marketing and technological prowess. Everlane, Ministry of Supply, Cuyana, Argent, Mm.LaFleur, Of Mercer, Mack Weldon, and Bonobos are some that come to mind, all of which operate on an online-first basis. At varying levels of maturity, some have supplemented their direct-to-consumer base with wholesale (Bonobos is now owned by Walmart and can be found at Nordstrom) along with physical stores. Everlane was one of the first startup brands to acknowledge consumers’ desire for transparency in the origins of their clothing, offering detailed information about its factories in China, Sri Lanka, Vietnam, Italy, Spain, Peru, and the U.S. Its designs are similar to brands like Vince, at half the price, with a greater sense of “good” attached. Other young brands like Reformation are producing trendy clothes at semi-reasonable prices with sustainability practices a central focus. Stella McCartney, at the high end, famously works only with non-animal materials to create “vegan luxury,” though I question the ultimate environmental friendliness of a polyurethane/polyester ankle boot. Elizabeth Cline’s Overdressed: The Shockingly High Cost of Cheap Fashion has impacted more than a few readers and shoppers. She suggests consuming more responsibly by buying second-hand, supporting local designers, and paying for quality over quantity. Last August, I wrote a post: 8 Ways to Shop Ethically, including scrutinizing fabric labels to avoid synthetic fabrics that don’t biodegrade very well. Spoiler: cotton, silk, and wool are generally safe bets. At a broad level, consumers are buying clothing that is designed for their lifestyle. No longer is there a predominant trend, but rather a number of recognizable paths. Ministry of Supply‘s performance workwear is borne from research and engineering (hence its NASA-esque branding), with the daily commute in mind. My brother and his girlfriend are big fans, as are enough other shoppers that the brand now boasts seven physical stores across the country. Even further on the functional side, athleisure, or technical athletic wear blended with casual clothing that can be worn outside of the gym (e.g. Lululemon, Athleta, Outdoor Voices, Sweaty Betty, Aether), is in line with the growing sociability and stylishness of fitness. Across categories, functional uses, and prices, the lines are blurring. Many of the brands I’ve already mentioned aim for a reasonable price point. None can claim decades of heritage or expertise, so they market on their innovation and conscientiousness to the widest possible band of consumers who have plenty but not unlimited disposable income. For many shoppers today, a high price is not necessarily central to a luxurious experience or product. In many segments of the market, new players offer a fresh point of view on products with similar quality and creative value as more established brands’ wares. 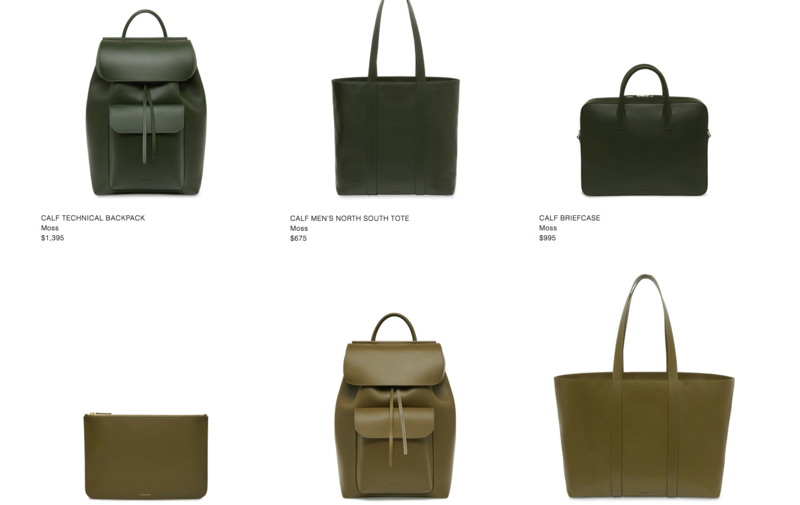 Clare V. and Mansur Gavriel are fresh near-luxury accessories darlings. Their bags almost all hit under $1,000, but are made in Italy. Established “accessible luxury” brands Michael Kors, Coach, Kate Spade are all made in China. Everlane’s handbags are made in Spain and Italy and are even more affordable at under $200. Everlane also makes shoes in Italy, as does online-only footwear brand M.Gemi, which hosts pop-up fit shops in a handful of markets. While labor costs in developed regions like Europe and the U.S. cannot be hacked with technology, eliminating the many steps involved in traditional retail (i.e. wholesale distribution) has made offering a quality product from a socially-acceptable point of origin, at a palatable price, much easier. Startups like Grailed and TheRealReal don’t sell their own branded items, but rather have helped establish new behavior in the mainstream: circular consumption of luxury and near-luxury branded products. They make access to niche, gently-used, high-quality garments more affordable and the habit of shopping second-hand less peripheral. Suddenly, a wool-synthetic blend Vince. sweater, made in China, is looking less appealing next to a second-hand Prada wool and silk cardigan, made in Italy. One has more cachet and artistry behind it, undoubtedly. The co-founder of TheRealReal says her resale business drives traffic back into luxury brands’ stores (Glossy). Consumers are more likely to spend on new high-end goods if they feel confident they can resell them later to recoup some of the cost. For consumers, the choices are many. Which brands are reliably good? Where do they go to get simple basics? What I keep hearing from people is they all end up at Nordstrom Rack because they get the brands they know (established ones) for less. However, there are a bunch of new brands (and more all the time) aiming to be smarter, more environmentally friendly, and transparent about their wares, mostly sold online, with a cautious entry strategy for brick-and-mortar retail. Ladies, for some fresh ideas, see my recent post about Modern Workwear for Women. For both men and women, I’ll say this: it just depends what kind of innovation is most important to you, what style speaks to you, and how much you want to spend. While the higher-volume near-luxury market is already busy with tech-savvy startups, many brands (and shoppers) are moving in the opposite direction, one where pricey but timeless clothing with a real personality (and quality) lives. Online is the way for brands to reach consumers directly, at scale, with less investment, but offline retail is still important. Major chains, established brands, and department stores are racing to evolve and remain relevant, because not all retail is going virtual. Many independent local shops and boutiques are thriving, because they have a unique point-of-view and sense of specialness, even the serendipity of throwback browsing and shopping #IRL. A piece many of these startups I mentioned haven’t quite mastered is the artistic value, the curation, the je ne sais quoi (identity), which takes time and distillation. Twig is about modern, classic and well crafted designs – clothing, shoes, accessories and objects. Our featured designers are about slow fashion – quality of materials and the craftsmanship that goes into creating pieces that will stay in your wardrobe for years to come. See my recent article about supporting local independent retail, which is related to supporting local brands, which often have that missing specialness that technological startups don’t. Also read Emily Holt: San Francisco’s New Fashion Hero. Me personally? Italy ruined my views of apparel and shopping. First, it renewed my love of browsing, searching, and hunting in person. And, speaking to a real human being during the purchase process. That is still a big part of the Italian way of shopping, and it’s a lot of fun to spend an entire day shopping and browsing while pausing for molti caffè, lunch, and afternoon aperitivi. Very few Italians shop online like Americans do, because it’s more about the destination than the journey. What’s more, I found myself owning beautiful, delicate knits, elegant outwear, and the pants I’ve ever worn, for not a fortune, from brands Americans probably aren’t familiar with, but are amazing nonetheless (e.g. Colombo, Paolo Pecora, C.P. Company, Massimo Alba, Care Label, Pantaloni Torino). Through a combination of shopping the semi-annual sales, second-hand, and at designer outlets, I amassed a shoe collection that is entirely made in Italy (and I’ll never go back!). My sweaters are all cashmere, silk, or wool, and I have this amazing deep claret waterproof parka from Aspesi that goes with everything. Returning to the states, with its ho-hum style sensibilities, high prices for imported fashion, and often dizzying array of options for any one type of item, I sorta “checked out” and haven’t bought much in a year and a half, other than the necessities.